Tomorrow night we kick off Victory in the Valley 2011 with Evangelist Gerald Mayhan. I promise you, this is one of my favorite times of the year as we come together for three nights to get our praise on, hear the Word, and witness people coming to Christ. How any Christian could not be excited about that is beyond me. Evangelist Gerald is a living testimony of the power of God at work. Check out his exciting testimony HERE. 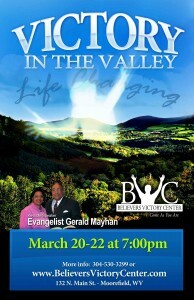 I hope to see you every night March 20 – 22 at 7 p.m.